– Line a baking sheet with wax paper. In small glass bowl, microwave chocolate on HIGH (100%) power for 1 minute. Stir until chocolate is completely melted. (If, after stirring well, there is still some unmelted chocolate, microwave for another 10 seconds, then stir until melted). 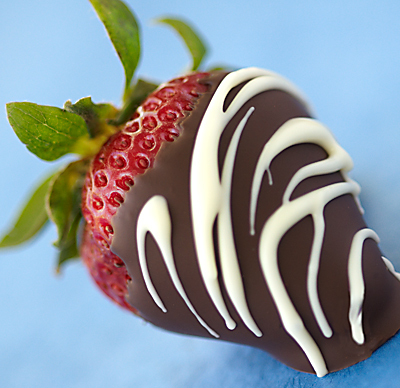 – Hold strawberry by stem and dip into the melted chocolate, covering about 3/4 of the berry. Gently shake off excess chocolate and place on wax paper-lined baking sheet. Refrigerate until set, about 15 minutes. – In small glass bowl, microwave white chocolate on MEDIUM (50%) power for 1 minute. Stir until chocolate is completely melted. Carefully transfer melted chocolate to a zipper-style plastic sandwich bag. Squeeze out excess air and seal bag. – Using scissors, snip a tiny corner of the bag. Squeeze chocolate from bag onto the dipped berries, using a random pattern. Refrigerate until set, about 15 minutes. Transfer berries to serving platter. Leftovers (ha!) may be stored in the refrigerator overnight. 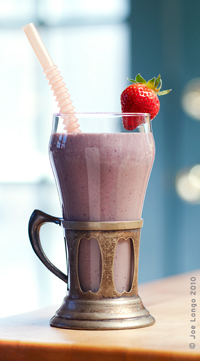 – Recipe can easily be doubled, tripled and more!!!! – Triple Chocolate? I like the way you think! Using dark (bittersweet) chocolate, follow the same procedure for the white chocolate. Pipe or drizzle in a criss-cross pattern over the white chocolate. Pretty! – I am a big fan of Baker’s Chocolate Baking Squares, and you can find them in any supermarket. – Think outside the strawberry! Try dipping kiwi slices, banana halves, pineapple chunks, and more. The trick is to pat the fruit dry before dipping. 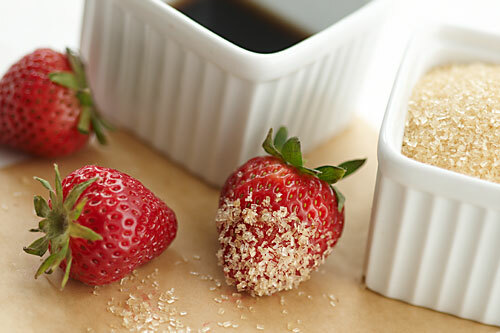 Who would ever think that strawberries, balsamic vinegar and brown sugar would be a tantalizing flavor sensation? I was skeptical when I was introduced to this at a shoot a few years back. I vividly remember an account executive, from a public relations firm representing strawberries, arriving at the studio with cases of beautiful ripe strawberries, aged balsamic vinegar and brown sugar. She rinsed the berries, and proceeded to pour the vinegar and brown sugar into separate small bowls. She told us to pick a berry, dip it in the vinegar, and then the sugar. I thought to myself, there’s no way I am going to like this! I have to tell you I was more than pleasantly surprised. The flavor combination was unbelievable. The robust, slightly sweet zing of the vinegar combined with the sweetness of the berry and the brown sugar—well, it’s beyond yum. It’s a unique taste sensation you will not soon forget. Try it! Hint: For the best flavor, use a good-quality aged balsamic vinegar, turbinado sugar, which is a raw cane sugar such as Sugar in the Raw from Hawaii, and the freshest local strawberries you can find! Serve these as an appetizer or dessert. And let me know how you like them!